In 1956 Bayard Rustin taught Martin Luther King Jr. strategies of nonviolence during the Montgomery Bus Boycott, thereby launching the civil rights movement. Widely acclaimed as a founding father of modern black protest, Rustin reached international notoriety in 1963 as the openly gay organizer of the March on Washington. Long before the March on Washington, Rustin’s leadership placed him at the vanguard of social protest. His gay identity, however, became a point of contention with the movement, with the controversy embroiling even King himself. Time on Two Crosses offers an insider’s view of many of the defining political moments of our time. 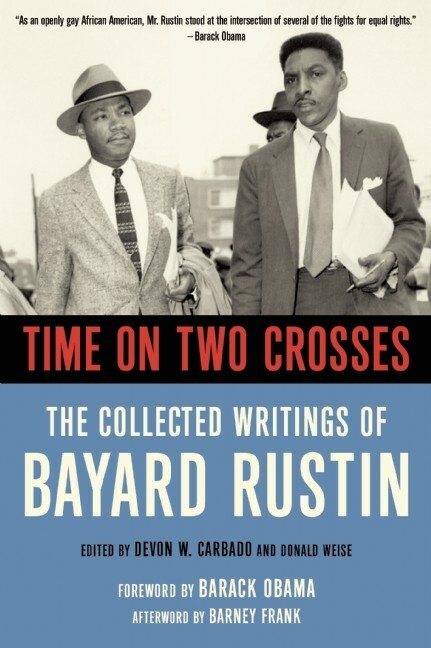 From Gandhi’s impact on African Americans, white supremacists in Congress, and the assassination of Malcolm X to Rustin’s never-before-published essays on Louis Farrakhan, affirmative action, and the call for gay rights, Time on Two Crosses chronicles five decades of Rustin’s commitment to justice and equality. Click the photo to purchase.